If you are looking for a tea kettle, you need to make a few considerations in order to ensure that you have the best product. Tea kettles come in all kinds. They are also made in different geographical locations. Products made in the USA over the years have attracted numerous buyers. Why is that? First, the products are said to have passed most international safety standards. There is also the belief that they are of high quality. If these claims are anything to go by, you should look for the best tea kettle made in the USA. Sadly, there just aren’t as many tea kettles manufactured in the USA as there are from other countries (primarily European). Unless you opt to buy the vintage way, it is incredibly difficult to find one. A large number of tea kettles listed in major online tea kettle stores are manufactured in China and other countries. If you want a tea kettle that is made in the USA entirely, it often requires a huge chunk of cash. Fortunately, as the products made in the USA are increasingly getting more attention from consumers, the number of options will soon start to increase, giving you more variety based on preference and budget. When looking for a USA made tea kettle, always check to find out if the entire kettle is composed of domestic parts or foreign ones. Some kettles are usually composed of some foreign components although they are labeled made in the US. If you want a 100% American made product, look for a kettle that is fully assembled at a local factory with domestic parts. Here is my review on the best tea kettle made in the USA – be sure to read on! First one is the Medelco kettle. It is assembled in the USA, but the glass is made in Germany and the lid is made in China. This is an old style kettle that reminds me of the first colonists in the wild west. I have an image in mind of a covered wagon traveling the prairie and this kettle balanced on the side of the wagon with other camping tools. Actually, the manufacturing process was started 200 years ago by Jacob Bromwell, which makes him the oldest homeware company in the United States. Being a handmade kettle by artisans, the surface is full of imperfection and IS crudely polished. It has a weight of 3.5 pounds and a capacity enough for two people. It’s perfect for use on an open fire, gas, electric or any other stovetop. If you are looking to replace your old kettle, but you also want to support local manufacturers and the economy, you should buy one of these kettles. You will not only get a great kettle out of the deal but you will also have helped to shape the American tea kettle industry. Unfortunately, these two kettles are all I could find. I would like to ask, if you know of any other kettles made in the USA, please leave it in the comments area below, and I will add it here. If there are no other kettles made in the United States, what should I do? Well, the answer might be to reconsider your preferences and take a look for kettles made in other countries including China. It is important to know that the problem with product safety really has less to do with where the product is manufactured. It could be China, Vietnam or where ever. It has more to do with the company developing and producing. It is wrong to say that Chinese products are cheap and toxic when they make a product according to the vendor’s specifications. China is a dominant force in manufacturing. Just look at the label on your t-shirt, shoes, lamp, and even your kettle and the fact is evident. Because it can be challenging to find a manufacturer that can produce a quality product at a fair price, most American tea kettle producers opt to have their kettles made in other countries. Additionally, the domestic manufacturing capacity is limited in America and is not nearly as vibrant as it is in other global factories. All being said if you don’t want to buy a kettle made in China, I found some good alternatives for you. Bear with me and read on! I am sure you will find the kettle you are looking for. Made from 18/10 stainless steel, it was designed in 1985 by Michael Graves and since then has been the most sold item in their history. When he designed this kettle he was thinking that people have a busy life and they need a kettle that boils fast, that’s why he designed the base wider, in this way the water boils more quickly, making it a favorite for busy modern-day users. Measures 8-1/2 inches in diameter and 9 inches high. The kettle is suitable for all cookers: gas, electric, ceramic and induction. If you are interested in art and design, then this is highly recommended for you. Why is it so expensive? Because you will pay for the classic form that will look great in your kitchen over its function. Designed by chef Paul Bocuse in France, it has a smooth bottom which makes him suitable for any cooking surfaces, including induction. It can also be used as a soup pourer. The Mulex samovar is a 2in1 kitchen tool. It combines the electric kettle and the teapot in one beautiful piece of art that will fit perfectly in your kitchen, where the teapot has its own place on top of the kettle’s lid. This is an advantage because it is kept warm by the steam from the kettle below. The kettle is made from 10/18 stainless steel on the inside, and outside is made from a high-quality synthetic material(not plastic), while the teapot is made from porcelain and a stainless steel anti-corrosion tea filter. A tea samovar is an excellent choice for a party. It holds 3 liters of water plus an additional 1 liter in the teapot. Not to mention that it will be the center of attention too. If you like the idea of samovars, you can read my review of the RAYA Electric Glass Samovar Tea Maker. This whistling tea kettle is both durable and timeless, handmade in England for over 100 years. It’s suitable for gas and electric stove where it makes a pleasant whistle when the water boils, but will never whistle on a ceramic or induction stove top. If the lid is not in place, the steam will escape around and it will not whistle. Made from top grade stainless steel mirror finished, this kettle will last a lifetime. The handle folds down to the side for easy storage, which is a great feature. It measures approximately 8.5’’ with handle up and 5.5’’ with handle down and can hold up to 2.5 liters of water. With a simple and elegant look, this kettle is the best choice when it comes to safety and durability. For those whom may want a Japanese whistling kettle, let’s take a look at the next kettle made in Japan. Similar to other kettles made in Japan, this one is made high-quality 18-8 stainless steel, the handle knob is natural wood and the whistle is 66 nylon resin and opens up/back on a hinge. When the water starts to boil you will hear a pleasant stone harmonica-like sound. All being said, this is a high-quality well-made kettle that I think it will serve you well. The Kaiko kettle is handmade by Japanese artisans and has a contemporary minimalist design that reminds me of the early period of samurais when the tea ceremony was an art. The wide bottom offers a better thermal effect, wide opening and wooden handle are the main features of this award-winning Kaiko series kettle. Even if small, this kettle is perfect for one person. The kettles seen so far, are not what I am looking for! If you didn’t like the kettles listed above, and you changed your mind about China made kettles, please read further. I have a few suggestions. The Chef’s Choice 680 Cordless Electric Glass Kettle, provides a fast way of brewing your tea at any time. The glass kettle offers you an opportunity to view the water as it boils. It uses 1500W to heat up water rapidly. Unlike other varieties of electric kettles, in this one, the heating element is hidden to prevent mineral buildup. Other features present in this amazing tea kettle include a cord storage, stainless steel casing, water-level gauge and a comfortable handle. The kettle can hold up to 1.75 quarts of water. It is also designed to ensure safety through the secure lid and automatic power-off feature. The glass kettle does not feature plastics on the inside. Hence, it does not produce a nasty plastic taste or smell. It has a slim design. This makes it appropriate to carry in a backpack when traveling. The heating element is hidden to prevent rusting and scaling. It also allows for easier cleaning. The glass spout is an added bonus. The kettle complements the countertop, due to its appearance. The electric kettle boils tea quickly and evenly. The water gauge can be read easily. If you are a tea addict, you might not like that this kettle lacks temperature control. It does not have as much capacity as other metallic kettles within the same range. The Chef’s Choice 680 Cordless Electric Glass Kettle is another great buy from Chef’s Choice line of products. It features a hidden heating element, a beautiful glass casing, and automatic power-off function. However, as compared with other tea kettles, it does not have a temperature control. The T-fal BF6138 Electric Kettle treats you to warm beverages within a span of minutes. It heats up liquids efficiently and fast. Depending on your tea choice, the electric kettle offers variable temperatures. This way, you can brew black, white or, better still, green tea. Once the set temperature is reached, the kettle shuts off automatically. It also switches off when you lift it from the base. It can hold up to 4 cups of water. One can also view the water level clearly from the outside. Another compelling feature in this unit is an anti-scale filter which removes impurities. It is also removable to allow easy cleaning. It is easy to use. Once plugged in, it starts working immediately. The heating element is hidden, to enable easier cleaning. The outer plastic casing is also simple to clean. It features variable temperature. With this, you can brew different kinds of tea. The cord is attached to the base. Hence, it can be left behind when you are pouring out the beverages. The cord can be stored in the dock. It can keep the brewed beverage hot for some time. It boils tea faster due to the 1750W power usage. The temperature knob does not tell the user the exact temperature of the liquid. The outside plastic housing gets hot as the tea boils, although the handle remains cool. The T-fal BF6138 Balanced Living 4-Cup 1750-Watt Electric Kettle with Variable Temperature is a real tea kettle. 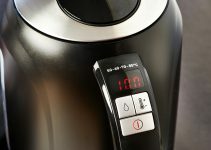 It features a temperature control, allowing the user to make varying types of tea. However, the plastic covering heats up, which means you cannot hold it by its body. The Capresso H20 Plus Water Kettle brews great tea for you, within a short time. It is beautifully designed to be a centerpiece on your countertop. Aside from the looks, it works efficiently and is safe to use. The lid has a silver finish. It is accompanied by an ergonomic handle. This electric tea brewer shuts off when the water starts boiling. In addition, the base can rotate to any side to suit both right-handed and left-handed persons. What more, when serving the tea, the cord can be left at the base of the kettle. It has an amazing design. No matter where you place it on the countertop, it stands out. The kettle’s glass casing offers excellent view of the contents inside. It heats up fast. Old tea kettles cannot rival the Capresso electric tea kettle. The blue light located on the handle, indicates when the kettle is on. If you leave the kettle running, do not worry, since it will automatically turn off once the boiling starts. The chrome finish on the outside tends to come off with use. The gasket surrounding the heating element releases a plastic smell/taste into the water. The Capresso H20 Plus Water Kettle is an amazing glass electric kettle. It is designed with high efficiency. But, most importantly, the kettle has an attractive design. However, it does produce a nasty plastic taste/smell. The T-Fal Vitesses BF6520 1.7 Liter Electric Kettle comes first in this review of my suggestions. This is because, unlike the other two, it features a variable temperature control. It allows the user to brew all kinds of tea. But the exterior plastic housing does heat up. The Chef’s Choice 680 Cordless Electric Glass Kettle is second in this review. It boils water fast and has a stainless steel construction for enhanced durability. However, it does not feature temperature controls. 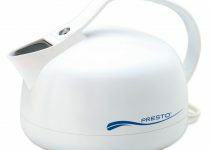 The Capresso H20 Plus Water Kettle is last in this listing. The design is amazing but the kettle produces a plastic smell. Furthermore, it is of lower quality compared to the other two tea kettles. Here you can find more reviews of tea kettles.